You get an email that annoys you, hit reply, type up your thoughts, hit send and feel instant regret. We’ve all done this. We’re frustrated and we let the other person know. Feedback via email is always a bad idea. You don’t know how the recipient will read and interpret your message. You can’t manage the tone of the message or give the person a chance to respond. And more often than not, he’ll reply equally frustrated. And now the non-conversation begins –back and forth, back and forth. 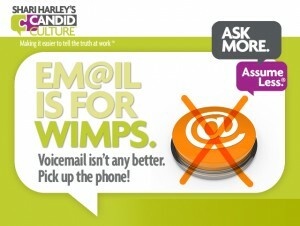 Email is for wimps and voicemail isn’t any better! No texting either. End the madness and pick up the phone or swing by someone’s desk. Things are resolved most quickly and easily by talking about them. I’m consistently surprised at how much feedback is delivered via email. And I’ll admit to occasionally being guilty of it too. I’m in a hurry or on a plane, and I want something to get done quickly. Or my emotions get the best of me, and I feel compelled to respond to a situation quickly. So I send an email or a text message that I know I shouldn’t send. Then I regret it and spend the rest of the day apologizing and feeling badly for communicating impulsively. If we want people to want to work with us and perform, we need to consider how our actions impact them. Yes, it’s easier to send a quick email or text. But it invariably annoys the other person and damages your relationships. People can work with you, around you, and against you. If people want to work with you, they’ll work harder and produce better work. Never underestimate the human ego, which is easily bruised. You are ALWAYS dealing with someone’s ego. The ego needs to be seen as good. When someone (anyone) calls our competence into question, we get defensive. Becoming defensive when receiving negative feedback or when someone questions us is a gut reaction. Not becoming defensive takes a great deal of self-management and is unusual. Slow down. When you have to give feedback, ask yourself what you want the other person to do. Then ask yourself, how do I need to communicate to get the result I want? Then pause, breathe, and pick up the phone.